Snoring and sleep apnea device therapy, termed Oral Appliance Therapy (OAT) or Oral Sleep Appliance Therapy (OSA), work similarly in that they slightly advance the lower jaw and tongue which helps keep the airway open while we sleep. If you've ever learned CPR you were taught to pull the jaw forward to open the airway. Try this - breathe normally and the push your jaw out or forward and feel the difference in air resistance! It's easier to breathe with the tongue and jaw forward. Now, pull your jaw backwards and feel the increased air resistance. 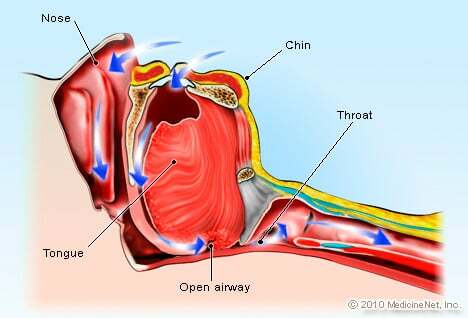 Harder to breathe, This is what happens when you fall asleep at night, your muscles relax and your jaw and tongue fall back into your throat blocking your airway. A partially blocked airway causes snoring or in more serious cases, known as Obstructive Sleep Apnea, your airway gets completely blocked and you start choking and gasping for breath. This fall asleep-choke-wake up-breathe-fall asleep-choke-wake up-breathe cycles all night long and disrupts restful sleep and you wake up tired and unrested. 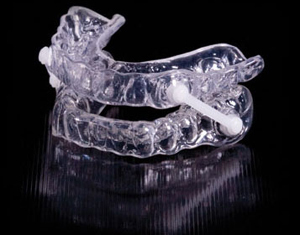 Mandibular Advancement Devices are small retainer type devices that, when properly fit and adjusted by dentists with advanced training, are well tolerated by patients and are most effective for patients that snore or are diagnosed with mild or moderate Obstructive Sleep Apnea. Those diagnosed with certain cases of severe sleep apnea can also be successfully treated. In fact, the American Sleep Disorders Association recommends dental device therapy for patients with severe OSA who are CPAP intolerant or refuse treatment with CPAP.